Manchester United will look to bring in Henrikh Mkhitaryan and Zlatan Ibrahimovic in an effort to reshape their attack next season. After they found the net on just 49 occasions last season, new coach Jose Mourinho is determined to bring in high-profile attackers to ensure a return to the Champions League for the Red Devils. 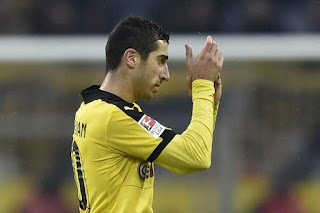 Arsenal had previously been interested in signing Borussia Dortmund's Mkhitaryan, although they were recently surpassed by their Premier League rivals, who are reportedly willing to pay around €37 million for the player. Manchester United are also hoping to complete the signing of Ibrahimovic, who is available on a free transfer following the expiration of his contract at Paris Saint-Germain. However, former club AC Milan are also considering offering the Swede a huge contract worth €11 million per season, whilst fellow Serie A outfit Roma have entered the race for his signature. Both players are represented by agent Mino Raiola, who discussed the English club's offer with Ibrahimovic whilst overseeing the potential Mkhitaryan deal. United officials are preparing to offer the 34-year-old a one-year contract worth €270,000 a week to bring him to Old Trafford.